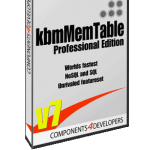 ANN: kbmMemTable v. 7.76.00 Standard and Professional Edition released! Fixed bug related to ADT fields. Added naive (non optimized) support for SQL joins. SELECT stattement in addition to at the end. Calculate and Evaluate still exists for one shot runs. And can be used on mobile, Linux, OSX and Windows 32/64 bit platforms.